Bali is in general divided and shared amongst Hindus and Muslims. It is quite an amazing site to see if you are lucky to witness an important ceremony. In Ubud we witnessed Nyepi and the Ogho Ogho festival. 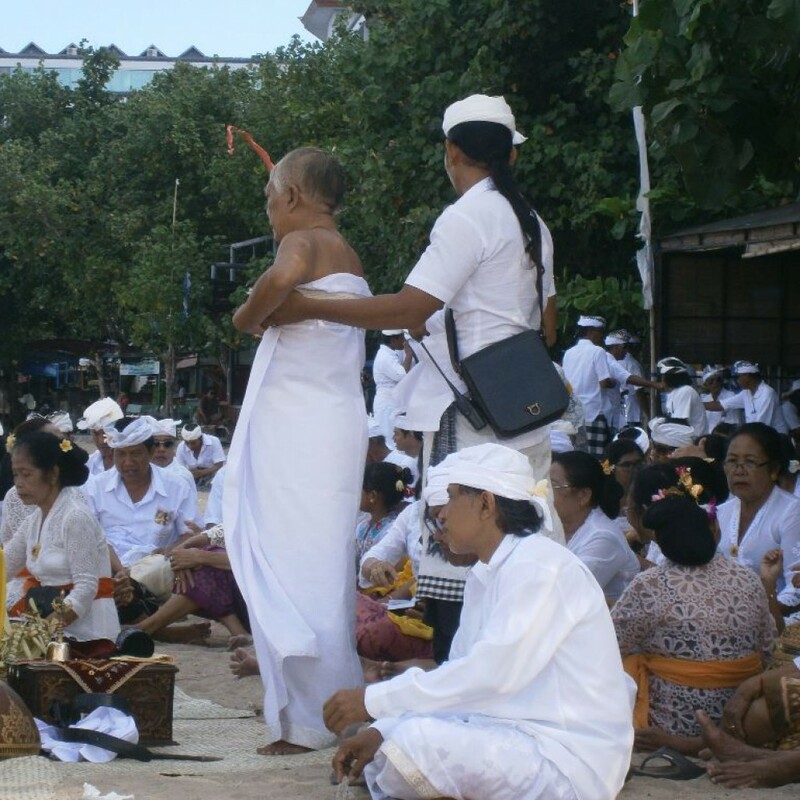 In Sanur we witnessed a completely different ceremony on the Sanur beach. We were just talking a slow walk along the beach as it was a nice day and we had plenty of time to kill. As we stopped to look out on the water and a massive kazeebo on a small peninsula, we could hear loud music and people singing behind us. We turned around and a long line of white dressed men came towards us with tall poles with something that looked like golden umbrellas on top. Behind them came women dressed up in Sarongs and lace shirts. All wearing their best clothes. It is not an unusual sight to see locals wear their native clothes in Bali, it is part of everyday life. Men and women kept flowing in from the narrow stone alley behind us. More and more golden umbrellas and what appeared to be offerings were brought in and placed on brought tables and on the sand in front of them. At first it looked like a wedding. But where was the Bride? It appeared to be some sort of offering ceremony. Nyepi had just passed and with it came a new year. One of the locals later told us that this particular community that came here this day was very dependent on the sea. Fishing being one of their biggest income they make a feast with offerings to the sea to bring them luck and fortune for the year to come. This was interesting to us because we had never witnessed such an event before. The women on one side and the men on the other all faced the offerings and the high priest, as we presumed he was, who was stripped and dressed in his white coat and the villages most precious jewels. He then blessed the offerings and the people with a holy water mixture as the people prayed and chanted. Our horror came much later when we realized that the offerings was not only fruit, nuts and gold. Live animals is a must when pleasing the spirits of the Sea. A startled duck was taken out of a box and a woman that was visibly honored by the task of pleasing the spirit of the sea took out a razor knife. We couldn’t watch it any longer and decided to leave the scene. The party would continue for hours and on the evening the next day there would be a big celebration with traditional Balinese dancing to celebrate the New Year offering. We love that these traditions is such a big part of Bali. We have never experienced anything like this and I am sure we will never forget it. The duck didn’t make it, he was sacrificed to the sea. But we will be back on Bali sometime in the future. It is one of our favorite places on earth so far.